[139 Pages Report] The Cooling tower market was USD 2.24 Billion in 2014 and is projected to reach USD 2.87 Billion by 2020, at a CAGR of 4.2% from 2015 to 2020. In this study, 2014 has been considered as the base year, while the forecast period has been considered from 2015 to 2020. The main objective of the study is to define, describe, and forecast the cooling tower market based on type, application, Construction Material and Design, and region. The report includes detailed information about the major factors, such as drivers, restraints, opportunities, and industry specific challenges influencing the growth of the market. The report strategically analyzes the market segments with respect to individual growth trends, growth prospects, and contribution to the total market. In the report, the cooling tower market has been studied for regions, namely, North America, Europe, Asia Pacific, and Rest of the World. In this report, the market sizes have been derived through various research methodologies. In the secondary research process, different sources have been referred to, to identify and collect information for this study on the cooling tower market. These secondary sources include annual reports, press releases, and investor presentations of companies; associations such as Cooling Technology Institute (CTI), American Society of Mechanical Engineers (ASME), Securities And Exchange Commission (SEC), American National Standards Institute (ANSI), and white papers, certified publications, and articles from recognized authors. 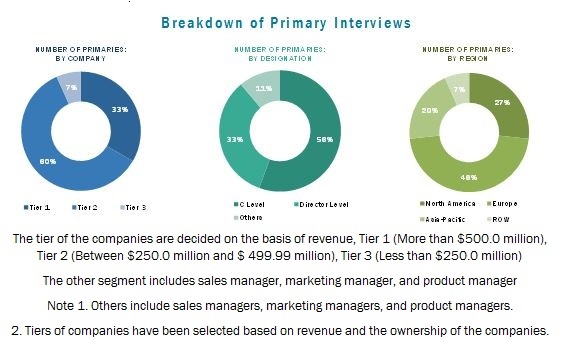 In the primary research process, sources from both supply and demand sides have been interviewed to obtain qualitative and quantitative information for this report. The bottom-up approach has been used to estimate the market size, in terms of value. The top-down approach has been implemented to validate the market size, in terms of value. With the data triangulation procedure and validation of data through primaries, exact values of the sizes of the overall parent market and individual markets have been determined and confirmed in this study. Cooling Tower value chain consists of manufacturers such as Baltimore Aircoil Company Inc. (U.S.) and Enexio (Germany), Hamon & Cie International SA (Belgium), and others. The next step in the value chain consists of distribution and marketing of cooling towers to particular end-use industries such as Power Generation, Petrochemical and Oil & Gas, Food & Beverage and others. Each region has been further segmented into the key countries in the region. 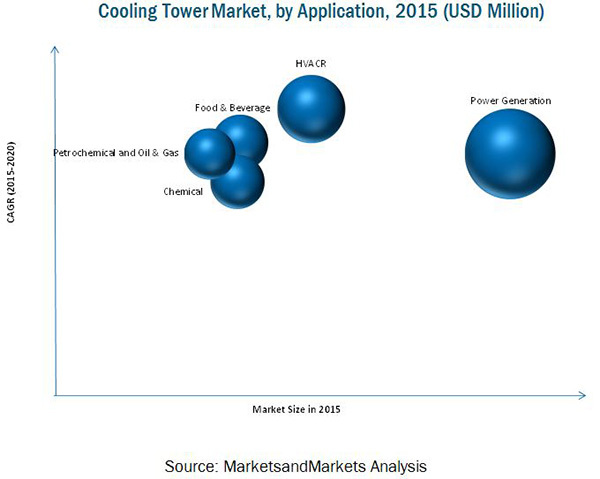 The cooling tower market is estimated to reach USD 2.88 Billion by 2020, at a CAGR of 4.2%. The market is driven by increasing stringent environment regulations, rise in HVACR deployments, and technological advances. However, the mature markets of Europe and North America are projected to inhibit the growth to some extent. The cooling tower are used in various applications, such as chemical, petrochemical and oil & gas, HVACR, food & beverage, and power generation. In 2015, the power generation application is estimated to account for the largest market share among all the applications, in terms of value, followed by HVACR, food & beverage, chemical, and petrochemical and oil & gas. The HVACR application is estimated to register the highest CAGR between 2015 and 2020 among all the applications. Asia-Pacific, North America, Europe, and RoW are considered as the main regions for the cooling tower market in the report. Asia-Pacific dominates the cooling tower market owing to increased demand from the HVACR application segment. Rising population, industrialization, and growing concerns related to infrastructure development have significantly increased the growth of the region’s building & construction industry, which consequently has triggered the demand for cooling tower. Power generation and HVACR are the top two applications contributing to the growing demand for cooling tower in Asia-Pacific. Europe is the second largest market for cooling tower globally. The sluggish growth of cooling towers in Europe and North America restricts the growth of the market. Although these regions have huge market size, the growth of cooling tower is estimated to be relatively slower than other regions during the forecast period. This is mainly backed by high market size and slow economic activity in these regions. However, most of the companies, including SPX Corporation (U.S.), Baltimore Aircoil Company (U.S.), and Evapco Inc. (U.S.), have strong foothold in the cooling tower market in the U.S. These companies are estimated to account for a significant market share in the near future. Other major manufacturers of cooling towers are Bell Cooling Tower (India), Brentwood Industries Inc. (U.S.), Enexio (Germany), Hamon & Cie International SA (Belgium), Paharpur Cooling Towers (India), SPIG S.p.A. (Italy), and Star Cooling Towers Private Ltd. (India). Foraying into related industries and technological advances will enable the cooling tower manufacturers to overcome the effects of a volatile economy, leading to diversified business portfolio and increase in revenue. 12.2 Baltimore Aircoil Company Inc.
12.11 Star Cooling Towers Pvt. Ltd.